Space Saving Design: Geometrically merges itself into the environment saving space, opening up walkways, and improving the overall flow and footprint of the room. Multi-Angle Equipment Monitoring: Because of its ability to mount in the corner, its sleek design allows your equipment to be monitored from virtually anywhere in the room. Easy One Person Install Mounting System: We understand that every installation is different and brings with it its own challenges. It is because of this that we have included a brilliantly engineered mounting system that allows the cabinet to be installed by just one person while still maintaining a 650 lb. load capacity. 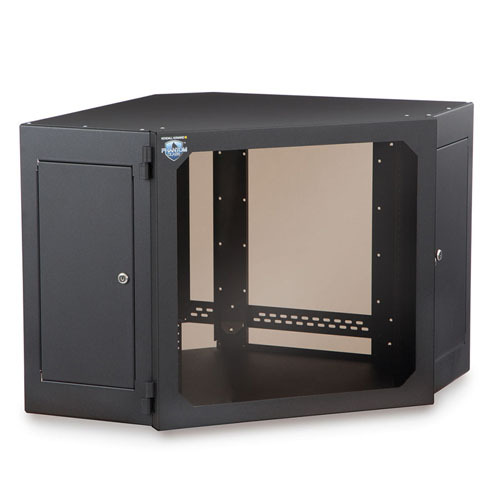 Removable Locking Access Panels: Complements the already user-friendly design by allowing access to the healthy 18" mounting capacity for maintenance or changes. Reversible Lift-Off Door: Simple lift-off capability can be left or right mounted for a universal solution that can be tailored to each user's specific needs. 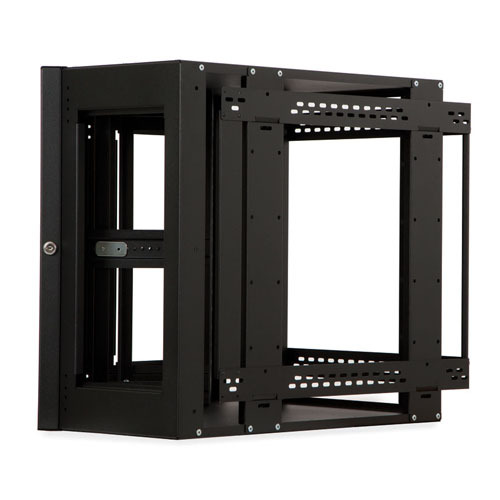 Open Back Design: As an added feature, we have created an open back design allowing cables to be easily fed through the wall, terminated, and managed prior to hanging the cabinet. Top and Bottom Laser Knockouts: To top it all off, we have added laser knockouts for fans and conduit in the top and bottom panels making it a breeze to configure for any application or environment.